Canada’s Bloody Secret is that this country enables the mass brutality and inhumane treatment of both US and Canadian horses. Why, because it is a multimillion dollar industry, fueled by greed and a total disregard for life. 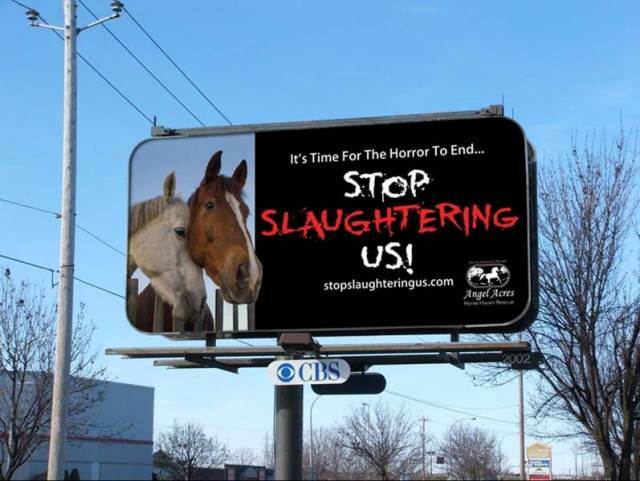 The US banned their own equine slaughter plants many years ago, so Canada took up the opportunity to make money by importing tens of thousands of US horses destined for slaughter and horse meat exportation to Europe. Our own wild horses face the same total disregard and what few wild numbers are being exterminated because they have no protection and are considered feral vermin. Retired racehorses, competition horses are all now part of the growing horse meat industry. With former Ontario PremierMcGuinty’s closure of Ontario racetracks that number of equine victims has increased, these horses contain toxic medicines administered during their racing and competitive careers that make the meat unfit for human consumption. The EU has already launched a full scale investigation into consumer fraud against companies within the EU that have failed to advise consumers that horse meat is often the prime ingredient in their products. This is a Billboard in Ottawa, the Nations Capital. Is it Bad Enough For You!! This Never Ending story is not a fairy tale!!! What is to become of the thousands of Wild Horses across the U.S. that continue to rounded up and shipped in the most inhumane methods possible across US boarders to Canada and Mexico for even more horrific treatment in Canadian and Mexican slaughterhouses??? 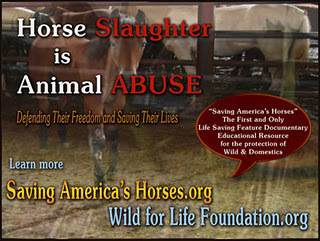 Canadian Wild Horses also are being slaughtered as well. Not just Wild Horses, but that retired race horse, that once beloved family horse and companion, that hard working competition horse that brought i n thousands of dollars, blue ribbons and trophies, those rodeo horses no longer considered useful. Horses used to produce medicines like Premarin and the mares who are constantly bred to provide milk for the ‘winners’ while their foals are destroyed and never stood a chance. “Mountain Grove, MO (EWA) – A bizarre chain of events has followed the contentious meeting of the Mountain Grove City Council on March 6th concerning the Unified Equine proposal to build a horse slaughter plant near the town.” ……………………. “But during the meeting city residents became inflamed by a presentation given by attorney Cynthia MacPherson, cataloging the pollution and crime that Chevideco’s Dallas Crown facility had brought to the town of Kaufman Texas.” …………………. “EWA contacted the Missouri State Police, the Mountain Grove police department and the YMCA director, Chad Watson. State police captain Duane Isringhausen, told EWA’s John Holland that he had received no such reports. The Mountain Grove police said they had heard the report and investigated but that they could find no evidence of threats being made to anyone. YMCA director Chad Watson said he had received no threats and had moved the meeting when he learned of its subject. “This place is for the children”, said Watson.”……………. In my own moment of silence, I will remember my favorite uncle Dan who served under U.S. General Patton, and who was captured by the Germans on February 14th, his birthday. His yearly visits to our home in Ottawa were a very real treat when I was a child, and it was he who started my wonderful collection of China horses. I shall remember Uncle Densel whom I never really knew who served in WWI and WWII and Uncle Bud who also served in both wars. A gentle man who bounced me on his knee as a child. It is not my intent to insult any of my readers, nor the Fallen War Heroes, the War Survivors or their families, and it is my hope that I will not by publishing this post. It is not my intent to belittle this very special day, it is my intent to provoke thought, and to enlighten. Beyond the human component of the Fallen Soldiers and the Survivors, there are also those additional War Heroes that need to be remembered….those that too often, though they survived, were left behind. Those whose names remain unknown, those that would have been long forgotten for their sacrifices had Tribute not been paid for their ultimate sacrifice as well. I speak of the many Military horses, dogs and donkeys that played such a crucial role in supporting troops around the world. I speak of the many animals that continue to be used by the Military even now, both overseas, at home and in the ongoing Military research facilities as live victims of experimental weapons. One need only use the ever popular Internet to research the many Animal Heroes throughout human history. War Memorials paying tribute to dogs who served during human war conflicts can be found at the Hartsdale Pet Cemetery in New York City; at the Maxwell Air Force Base in Alabama; March Field Air Museum in Riverside California and the National Infantry Museum at Fort Benning, Columbus, Georgia; and a replica of the monument located in Guam at the U.S. Marine Corps War Dog Cemetery can be found at the University of Tennessee College of Veterinary Medicine as well as elsewhere in the World. Dogs of all breeds continue to serve humanity today. From the highly trained military and police dogs, the K-9’s trained in Search and Rescue, trained to sniff out bombs and narcotics, trained to take that bullet for their handler…to those who are the eyes of the blind, who bring solace to the elderly, the ill, the handicapped and the physically and emotionally impaired. Nor can we forget those specifically bred for research such as Beagles bred and sold to laboratories around the world, or the un-adopted shelter animals sold to and held in laboratories subjected to continued experimentation, Live Terminal Surgeries, toxic chemicals, poisonous gasses all in the same of science, medicine and the weapons of war ……apparently for the betterment of humanity. We do not hear as much about the sacrifices these animals make, the dogs, cats, chimps, monkeys, rats, guinea pigs, rabbits, sheep, cattle…because they are behind closed doors and because the public in general does not want to know what goes into making a new line of cosmetics, household cleaner , drug therapy or any other such advancement to benefit mankind. Nor can we forget the horrors inflicted upon Factory Farm animals that wind up on human dinner plates, those murdered for their fur to fulfill human ego and an exploitative means to generate income. We cannot forget the Puppy Mills, the Battery Hens, the Kitten Mills, the Dog Fighting Rings. We cannot forget The American Wild Horses and the brutal Bureau of Land Management Round-ups for slaughter, ensuring that land is available for the cattle industry; the mass slaughter of Alaskan Wolves, the wildlife taken by Trophy Hunters, and Outfitters; the wildlife displaced and destroyed due to human expansion and exploitation of the environment. We cannot forget the whales, dolphins, sharks and so many more, we cannot forget the many species such as the Carrier Pigeon or the countless others that became extinct due to human activities. Somewhere I read that every so many seconds one species of animal becomes extinct never to be seen again on Planet Earth. Plain and simple.. We Cannot Be Allowed to Forget Any, be they the Military and Police Heroes of the Animal Kingdom or those who continue to suffer each and every day around the world. Each and every life is precious, each and every life is to be honored for their individual sacrifices. Each and every one of these animals is a Hero in their own right.